I'm a fan of plain ol' white bedding. I must confess, however, that I love to decorate my basic bed setting with some patterned pillows and throws, like florals, stripes and polka dots, just to create a more playful atmosphere. I'll be trying out this diy by Joy of frock files on to a pair of white pillowcases of mine (I.own.a.lot. you know) for sure. If you want to try it for yourselves as well, see the tutorial at you are my fave. P.s. If you are a fan of confetti dots on fabrics, you should check out this diy as well! 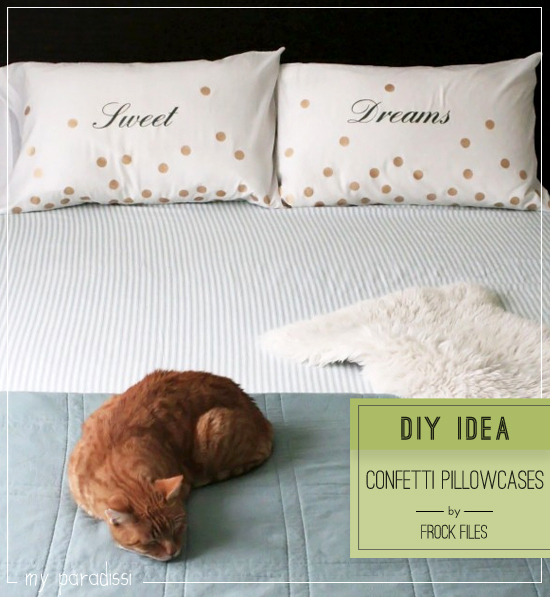 2 comments on "DIY: Confetti pillowcase"
Oh this is such a brilliant idea, love it!